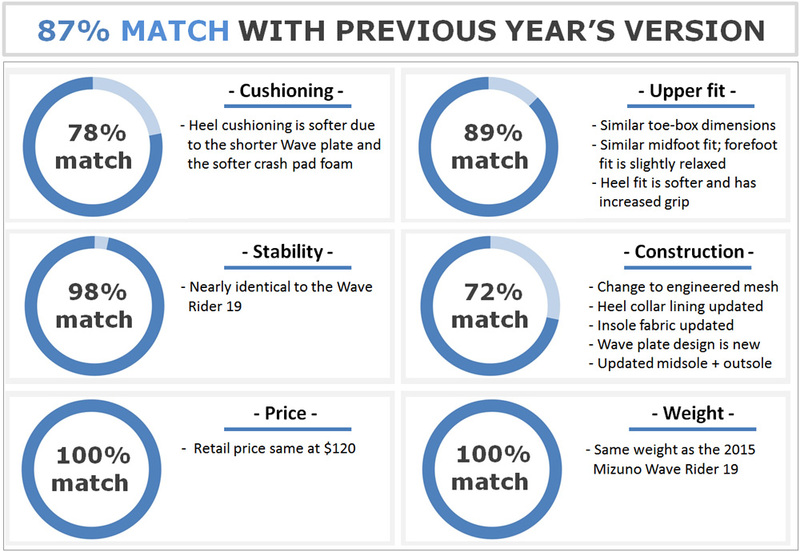 Mizuno’s marketing pitch: The softest, smoothest, most responsive Wave Rider yet. Upper: Engineered mesh, synthetic leather, molded urethane. Midsole: Dual density compression molded foam, Wave plate insert under the heel. 12 mm heel offset. Don't be scared by all the 'newest and latest' marketing. 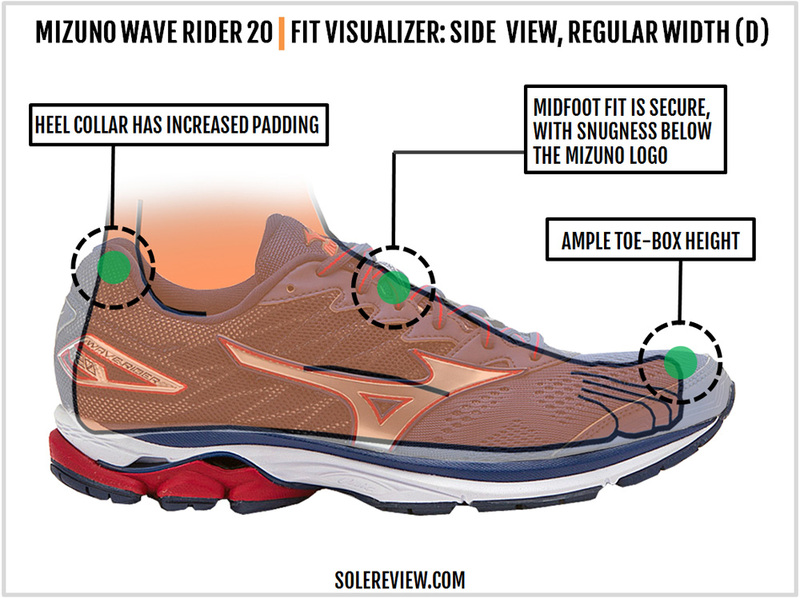 The Mizuno Wave Rider 20 gets to keep its signature Mizuno-ness, thanks to the Wave plate under its heel. All the updates are small improvements over the 19. When a brand says that its latest model is the result of two decades of evolution, and that the shoe in question is the softest, smoothest and most responsive version yet, that’s reason enough to make anybody nervous. Changes are happening at breakneck speed in the footwear industry, so a new model update might not always be a good thing. All of us await a new shoe with bated breath, secretly anxious that what you once loved will be gone forever. But hey, relax. This is a Mizuno we’re talking about, so no earth-shattering changes take place. 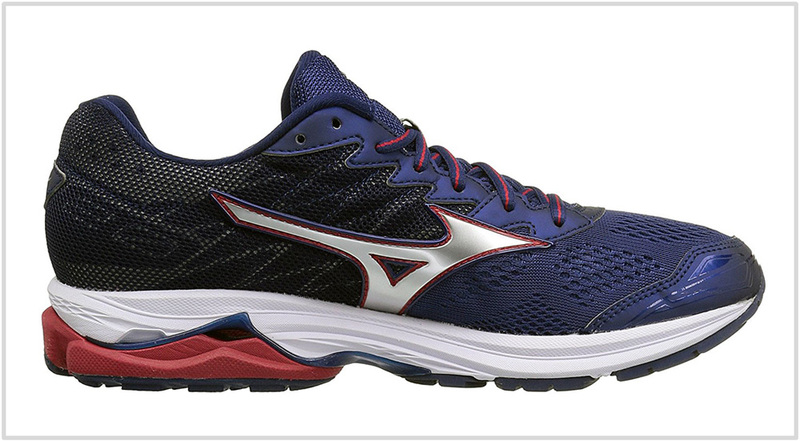 All of Mizuno’s moves are kept in check by a dependable gatekeeper – the Wave plate technology. As long as the Wave plate exists, a Mizuno will retain its Mizuno-ness. 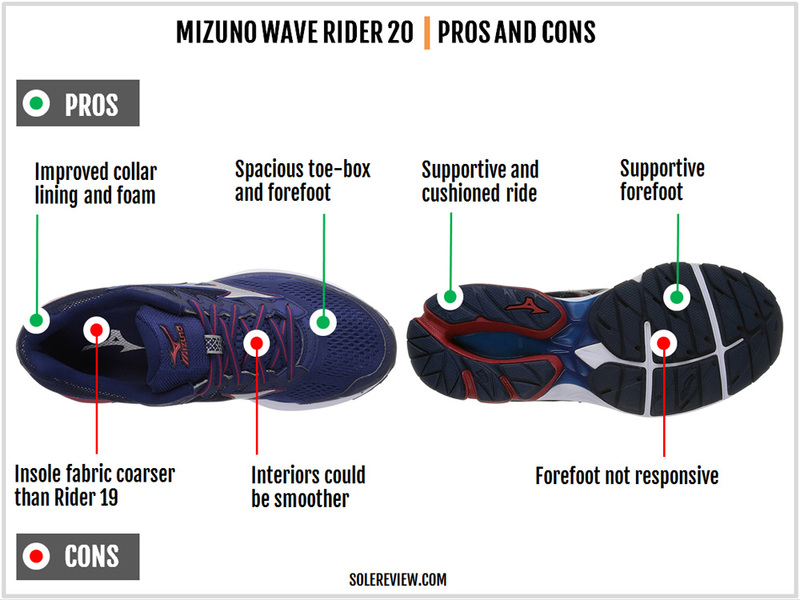 While it is true that the Wave Rider 20’s ride is softer than the 19 due to the updated foam crash pad, the hard Wave plate sandwiched between the foam layers help the Rider 20 retain Mizuno’s signature ride quality. There are updates aplenty on the upper. The mesh has changed to an engineered kind, and the upper packs in a lot of aesthetic extras. There’s a small reworking of the Wave plate design and the upper fit, but nothing which changes the shoe’s core persona. On paper, the Mizuno Wave Rider 20 is a neutral cushioned shoe which goes up against the likes of the adidas Glide Boost, Saucony Ride and the rest. But anyone who’s worn both the Wave Rider and other neutrals knows that the Mizuno is cut from a different cloth. The Rider 20 has turned slightly softer, but that’s purely contextual in a Mizuno sense. 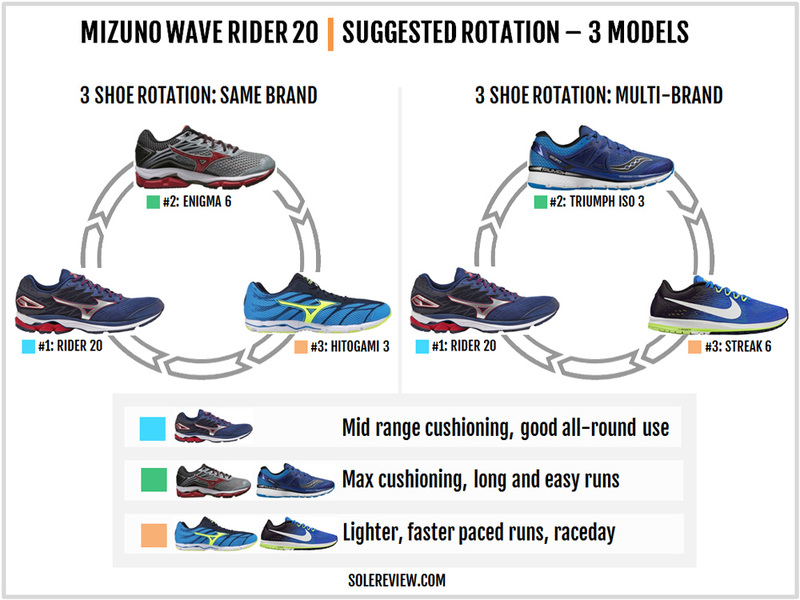 Given that the midsole retains the Wave plate, the WR-20 rides firmer than most of the shoes displayed on this chart. It stands to reason that the only shoe close enough to the Rider 20 is another Mizuno – the Inspire 13. 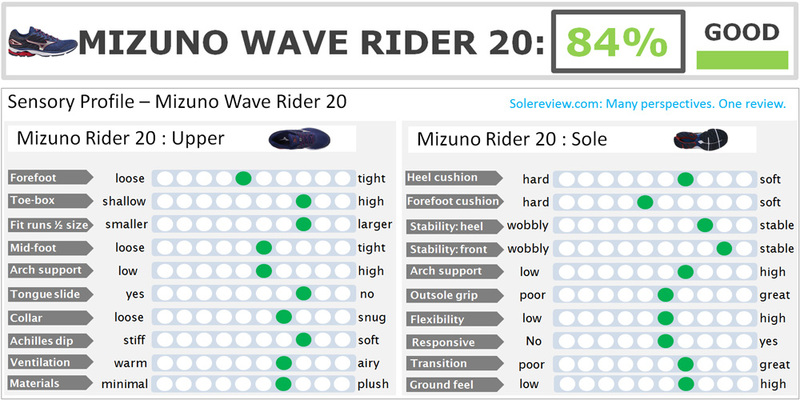 The Inspire is marketed as a support version of the Rider, but considering Mizuno’s use of the Wave plate as a stability device, the Inspire has none of the motion control behavior experienced on many others. Besides, the Rider 20 has a Wave design variation which restricts movement on the medial (inner) side. Guess that’s true for most neutral shoes regardless of the brand; the medial midsole is usually more supportive than the lateral side. In case you’re looking for a shoe which is slightly softer than the Rider 20 without being mushy, then the adidas Glide, Saucony Ride 9 and the Underarmour Speedform Gemini 2 are worth trying. Compared to the Ride/Glide/Gemini, the Rider 20’s forefoot and toe-box has the most room. On this list, the Brooks Ghost 9’s forefoot room is a close match to the Rider 20. The Rider 20’s design basics stay the same. The business end of the shoe has a synthetic leather toe-bumper similar to the Rider 18 and 19, and a thick Mizuno Runbird logo is stitched on both sides of the midfoot. The lacing area retains the reinforced eyestay panel with raw edge eyelets, and all of that runs over an un-sleeved tongue. The mid and rearfoot upper has a different mesh than the front, and the collar shape is a familiar sight too. If the upper is based on a legacy template, then what’s new? The engineered mesh is new. The added details over the mid and rearfoot mesh are new, and the collar lining and fill are new. The Wave Rider 20 is the first Rider to use an engineered mesh for its forefoot, an industry standard which combines open and closed areas on a single piece of mesh. This new mesh replaces the older spacer type used on the WR-18 and 19. The top and the sides of the forefoot have an open weave, and that’s flanked by a closed mesh area with a denser structure. While the WR-18 and 19 had a plain looking mid and rearfoot, the 20 introduces additional design elements. The mesh has a quilt-like stitching over the patterns visible underneath. On the medial side, the text ’20’ can be partially seen under this mesh. The outer heel has the shiny logo call-out, similar to the Wave Rider 19. You could say that the WR-20 is a throwback to the Wave Rider 16, which also had detailing over its midfoot. The fabric used on the heel lining is updated. While it’s not very different from the WR-19, the mesh is slightly softer with more foam packed inside. The tongue is not-sleeved, but as usual it is well padded with a very wide flap like the WR-19. This design reduces tongue slide, a feat successfully accomplished by the Wave Rider 19 as well. Mizuno replaced the stiff, twisty laces of the WR-18 with a softer semi-stretch kind on the WR-19, and the same laces carries over to the 20. For all the marketing pointing out the changed Wave plate design – now rechristened as CloudWave – the midsole design bears an uncanny resemblance to the last year’s WR-19. Like the WR-18 and 19, the midsole uses a single-density foam base under the forefoot, and a stack of dual-density foam and Wave plate under the heel. 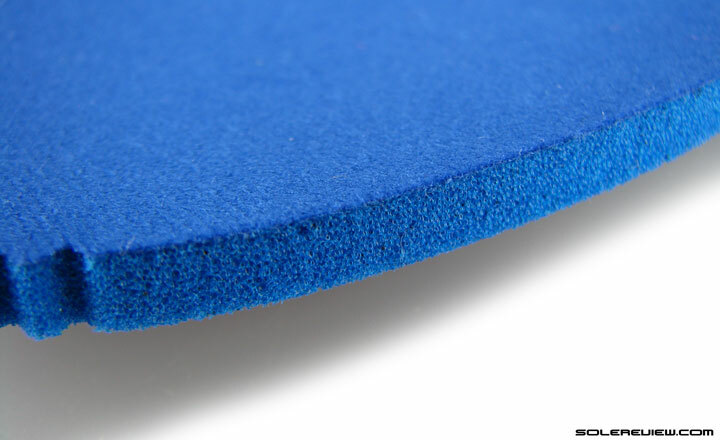 The foam used over the Wave plate is firm, and the crash pad located below the Wave is a softer type. 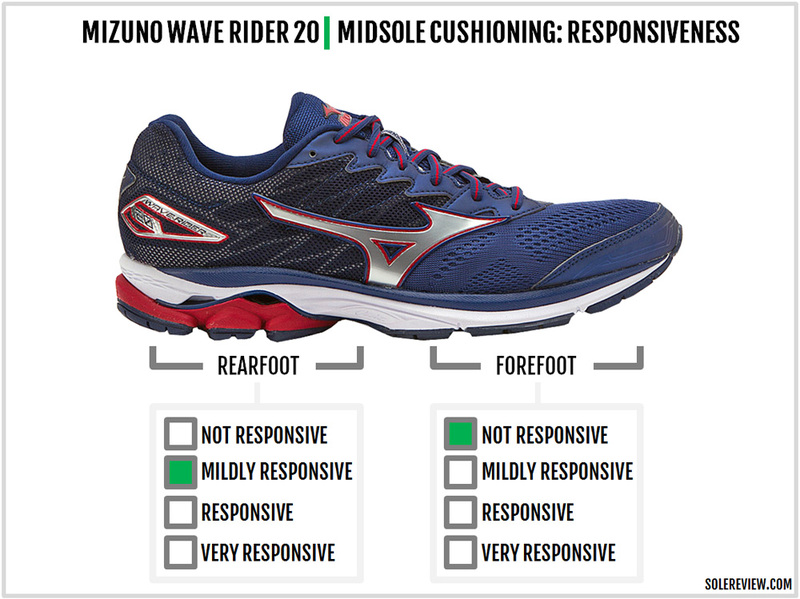 But there’s a good reason why Mizuno claims the Wave Rider 20 to have a redesigned ‘Cloudwave’ plate. The basic Wave plate design hadn’t changed from the Wave Rider 8 to the 19; a mid and rearfoot plate stopped right short of the heel edge, where it was met by a firmer wedge of foam. On the Rider 19, Mizuno called this srtouch. The Wave Rider 20 makes a couple of tweaks to this set-up. 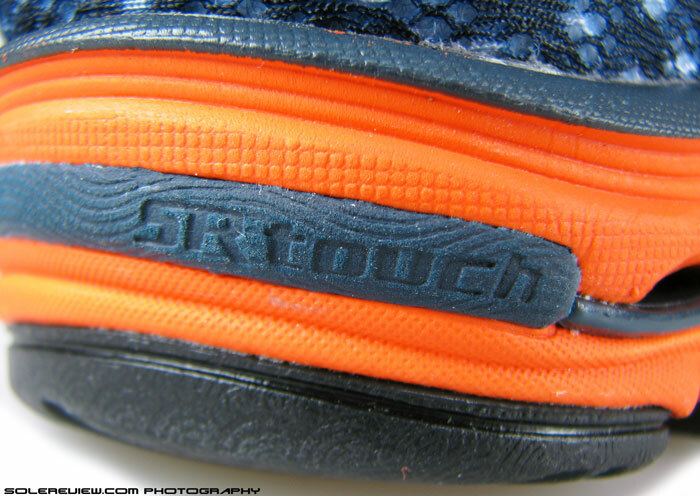 First, the hard srtouch foam wedge has disappeared, so the heel edge goes from triple density to dual density. 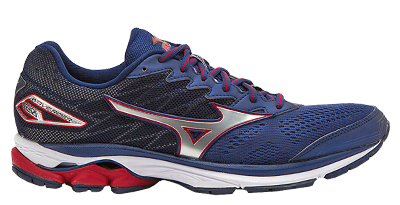 The 2016 model introduces a shorter Wave plate under its heel. Whereas the WR-19’s Wave extended all the way to the heel edge, the new plate stops much before the heel edge, which means that the rearfoot has more foam, less plastic. 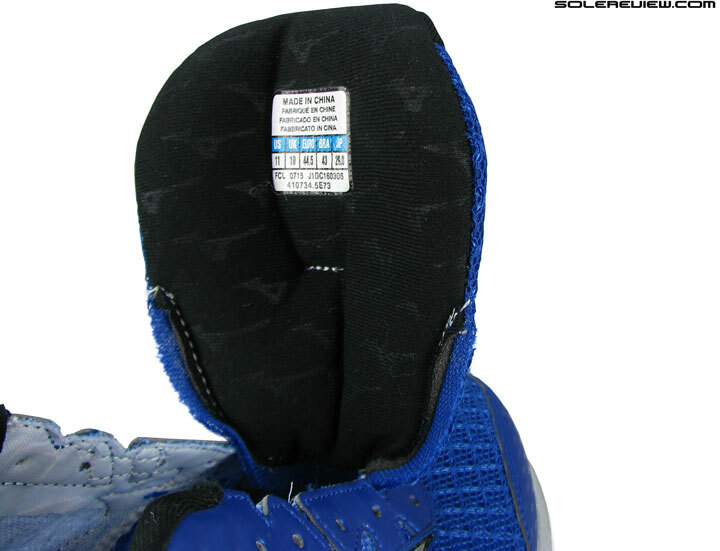 The outsole layout is similar to the WR-19. Under the forefoot, large blown rubber lugs are separated by a few flex grooves, and the heel has a harder quality of rubber. The outer forefoot gets two complete flex grooves instead of the WR-19’s partial notch, which makes the WR-20 easier to bend than the 19. Under the heel edge, the crash pad groove moves towards the heel center, whereas the WR-19’s crash pad groove was medially biased. Both the WR-18 and 19 had a cavity between the rubber mounted columns under the heel. The WR-20 has it too, only just longer and wider. Considering that the rubber outsole area hasn’t shrunk in size, it appears that the actual heel base is wider than the 19. If you look closely, you’ll find that the foam below the Wave plate extends outwards along with the outsole edge. The insole uses a soft, open foam base which is identical to the WR-19, but swaps the ultra smooth top-cloth with a regular mesh. Have no absolutely no idea why Mizuno chose to make this update. The smooth fabric felt excellent in the past Mizuno models, and there was no good reason to change it. Going by experience, Mizuno outsoles hold very well over distances. The harder heel rubber is extremely durable, and the durability level of the forefoot blown rubber is acceptable. 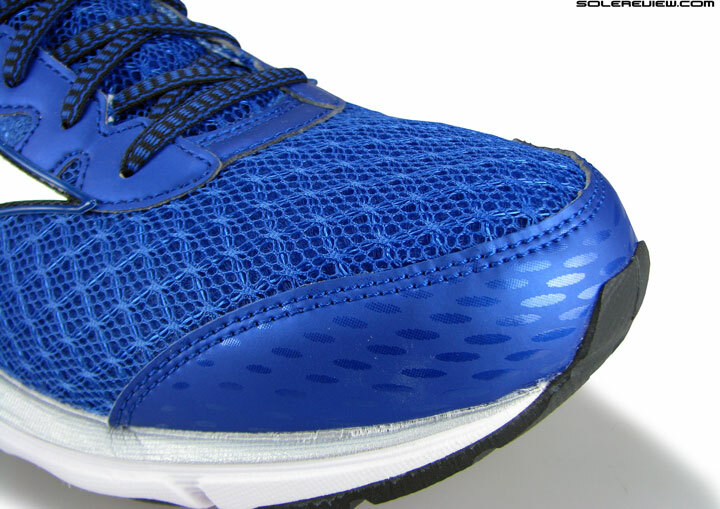 The spacer mesh equipped Wave Riders had a common complaint of the toe-box mesh tearing over time. That could be entirely due to the spacer mesh used, and the WR-20’s switch to an engineered mesh could potentially help improve the upper durability. For now, we’ll assume that the upper will go through regular (and gradual) wear and tear, lasting slightly above the median durability standard. The stitched toe-bumper ensures enough toe-box room, both in height and sideways. The midfoot is snug because of the outer Mizuno logos; since the thick logos are stitched over, they form seams inside the upper. There are tapes over the seams, and as a result the forward midfoot area has a band-like fit quality. Not uncomfortable, but rather a sense of localized snugness. For just this reason, running barefoot in the Wave Rider 20 isn’t advisable. The tongue is plush and splays wide over the foot. Despite the lack of an inner sleeve, the wide flap prevents excessive tongue slide. The tongue lining has been updated to match the heel lining, which has a soft hand feel. More foam is packed inside the heel, and this raises the grip level compared to the past Wave Riders. A couple of things around the forefoot eases up the fit relative to the WR-19. The length of the stitched-on toe bumper is shorter than the 19, and the inner midsole doesn’t appear to curve as inwards as the 19. Both these factors combine to create slightly more room than the 19, but without any sloppiness. 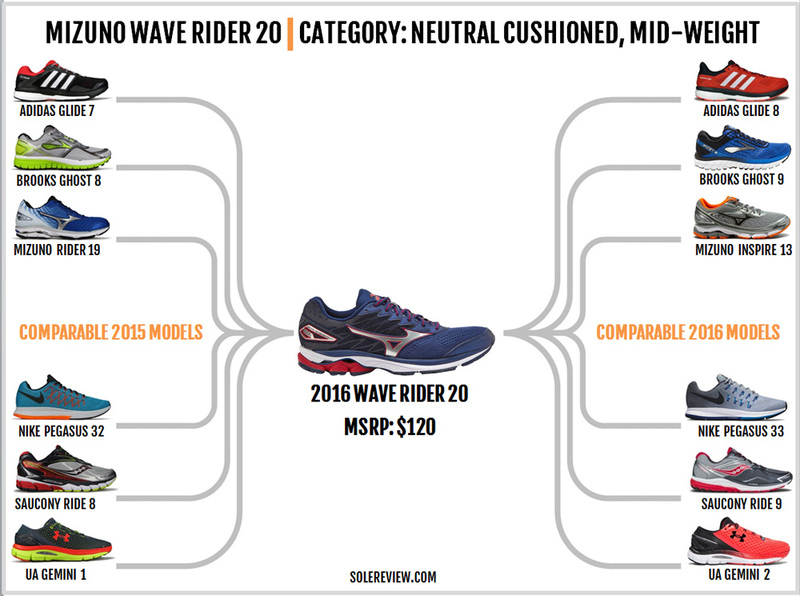 The Wave Rider 20 fits true to size with a comfortable margin ahead of the big toe. The stitched toecap also creates enough space adjacent to the big toe. 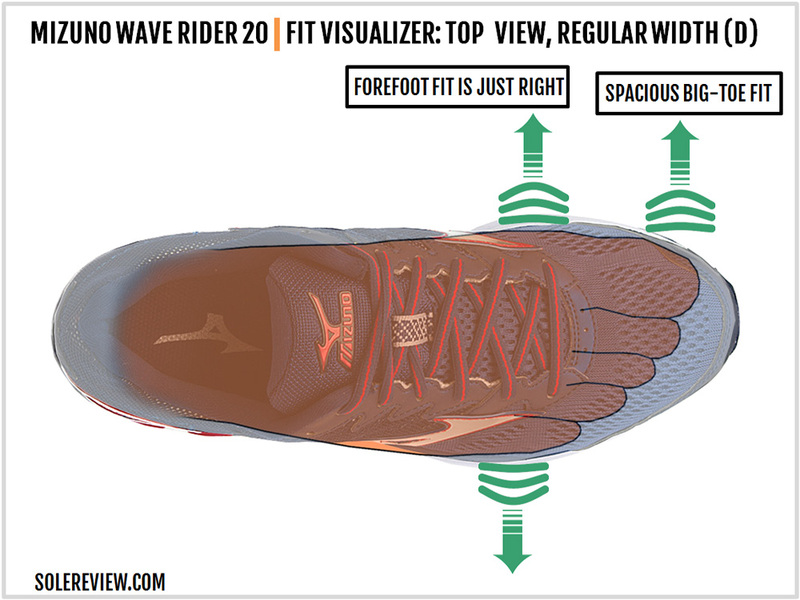 The Wave Rider 20 is decidedly softer than the 19 under the rearfoot. The absence of the firm srtouch wedge, a shorter Wave plate, and a softer quality of crash pad foam makes the heel landings softer. That said, the softness is not distributed equally. The bottom of the rearfoot midsole (below the Wave plate) turns softer due to the foam change, and the heel edge also loses firmness due to the lack of the srtouch wedge and the Wave plate rationing. The forefoot softness hasn’t changed, at least not to the extent you’d notice. Except for the soft insole overlaid on top, the midsole foam is relatively firm. Like many Mizuno models, the Wave plate and foam combo need some time to break-in. After all, the rearfoot is triple density, and two of the components – namely the stiff Wave plate and foam – are diametric opposites. These materials need to bed-in, and around 50 miles should do it. The forefoot is all foam and no Wave, so the ride experience is flat. What Mizuno uses for its midsole is regular EVA foam, so there’s little rebound action. On the other hand, the rearfoot produces some semblance of responsive behavior. Now the thing is, the Wave plate by itself isn’t responsive. On mid-weight models such as the Rider 20 and Inspire 13, the plate is quite thick and doesn’t splay out. The only exception is the tail-end of the Wave plate which happens to be located near the heel edge. Rearfoot strikers will experience responsive ride behavior near the heel edge, where the tail-end of the Wave plate will flex under weight. As far as the rest of the rearfoot is concerned, the Wave plate doesn’t splay out – rather, whatever spring-back you get is due to the foam layering. Upon landing, the foam compresses into the Wave plate gap, producing an effect which resembles responsiveness or spring-back. Even so, this behavior is localized near the area where the midsole foam meets the outsole. Any midsole will compress based on the path of least resistance. In the Wave Rider 20’s case, the order is the softer crash pad foam first, followed by the firmer midsole foam, and finally the ultra-rigid Wave plate. On lighter Mizuno models where the midsole foam is much firmer and the Wave plate is thinner, responsiveness is delivered by different means. But that’s a story for another day. 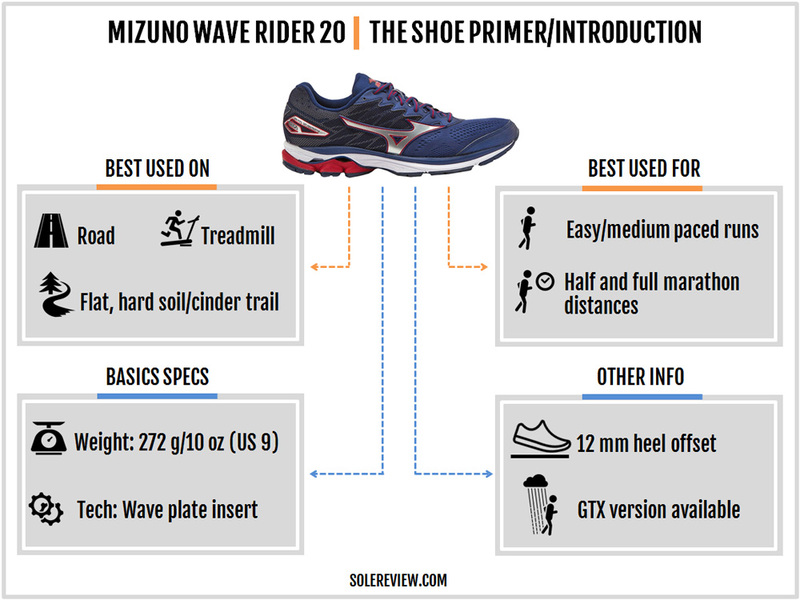 Nearly all Mizuno shoes are inherently stable owing to the Wave plate design, and the Rider 20 is no exception. Even with the shorter Wave plate, the heel compression is even. The large plastic plate and the cavity underneath keeps the rear-foot centered. The forefoot has a reassuringly planted feel which hasn’t changed since the last version. Not only does the forefoot has a wide base, but the foot is seated on a shallow curve inside the shoe. 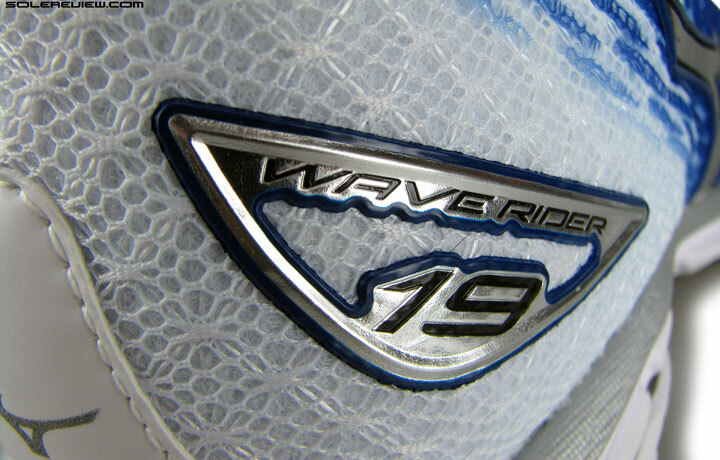 For rearfoot strikers, the transition quality will feel different on the Wave Rider 20 compared to the 19. Because of the shorter Wave plate and the softer crash pad, the midsole near the heel edge is softer. 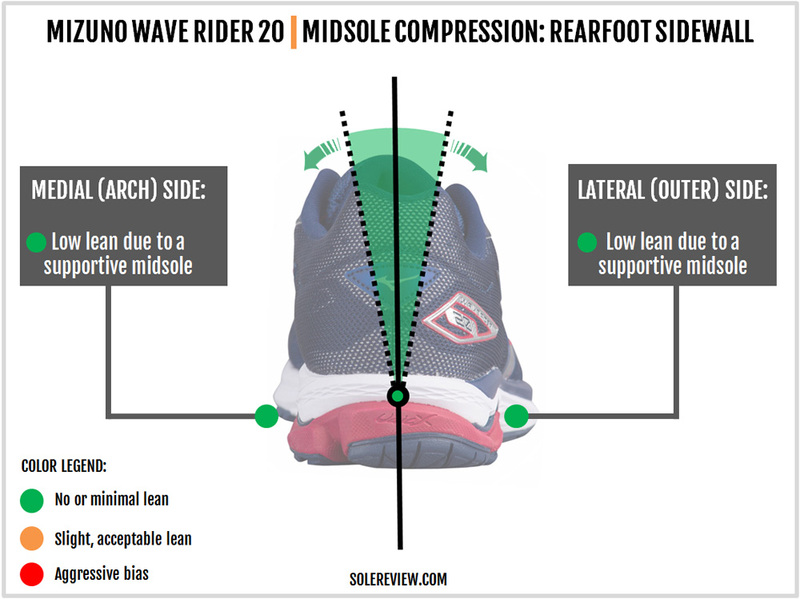 Runners who strike on the further heel edge will find the Rider 20 to land softer, and the transition along the medial side will also come across as softer than the WR-19. The forefoot is more flexible than the 19, but that doesn’t change the quality of roll-off, which feels as smooth and connected as the WR-19. 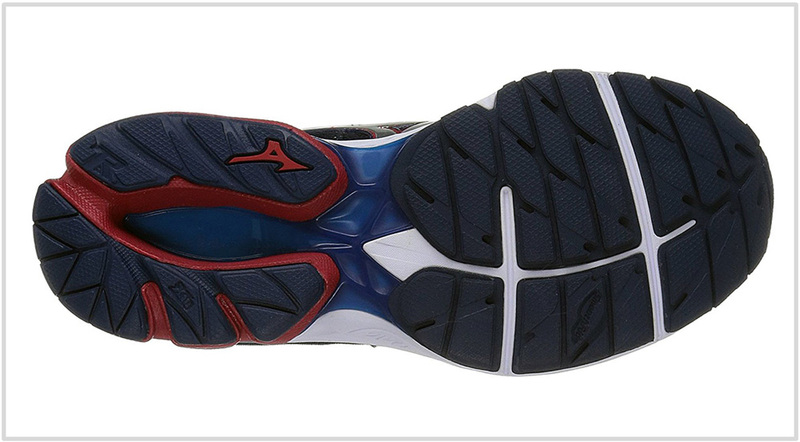 We like the Mizuno’s narrow groove separating the outer and inner forefoot outsole. Unlike some Asics models where a wide groove made the corners of the rubber slabs felt underfoot, the WR-20’s narrow transition groove helps create a smooth riding base. Like any Mizuno, the ride is very supportive. 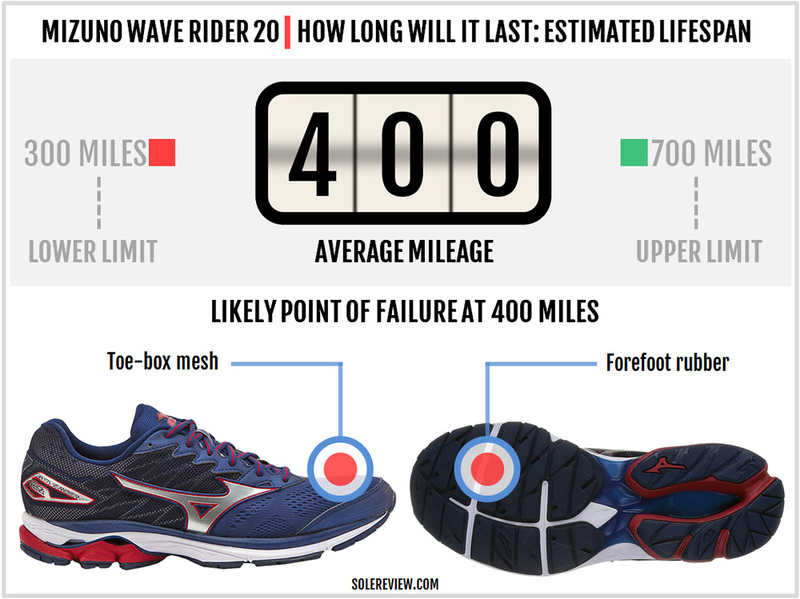 Be assured that the Rider 20 does not have any of the midsole lean seen on other foam-only running shoes. Likewise, the forefoot feels planted and sure-footed. The Rider 20 has a nice fit which is an improvement over the past versions. The updated forefoot and heel design increases upper fit comfort, and soft semi-stretch laces are a nice touch. There are a few things which the WR-20 can do better. While the Mizuno logos outside provide structural support, they also create taped seams inside. A smooth interior is a given nowadays, and it is here where Mizuno comes up somewhat short. The rearfoot midsole has a lot going-on, and the forefoot is plain in contrast. We know that shoes such as the Enigma try and address this imbalance, but the Rider 20 needs to try harder to make the forefoot a more engaging place to land. 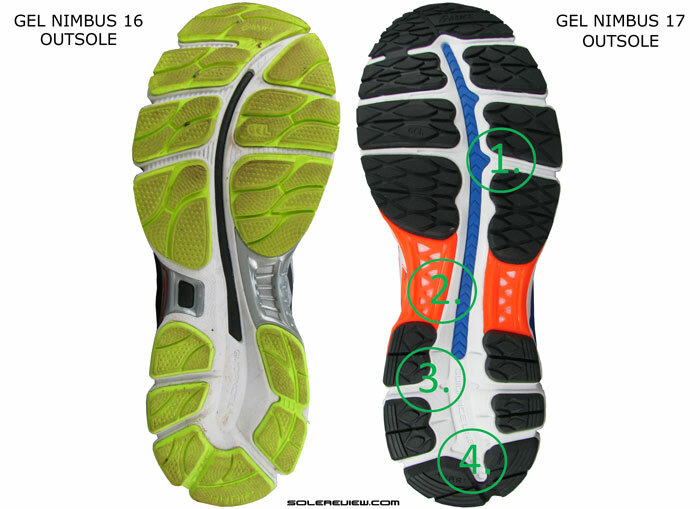 Perhaps a different kind of responsive foam (or combination of) under the forefoot could do the trick? The Wave Rider 20 performs perfectly well as an all-around shoe. But what if you wanted more cushioning? The Enigma 6 is a good shoe to consider, though be forewarned that the word ‘cushioned’ is strictly used from a Mizuno point of view. When it comes to any Mizuno, you’ll always have the ride spiked with the firmness of the Wave plate. The Enigma is cushioned but not soft; there is a difference. The Hitogami has been a popular Mizuno lightweight for fast running days, and the 3rd version stays a safe choice for that use case. 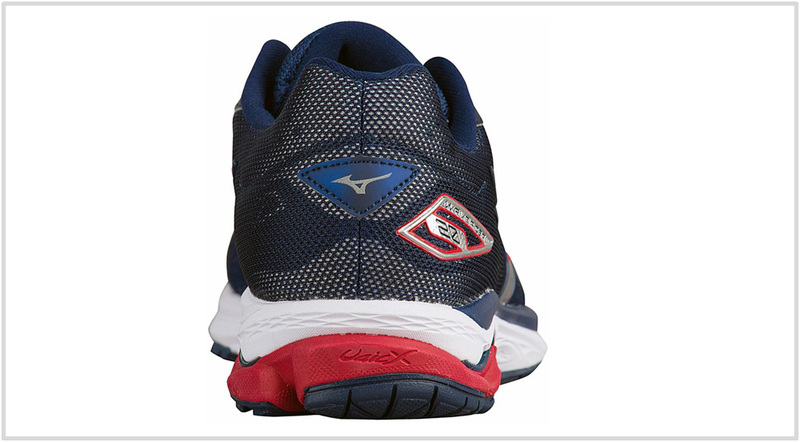 Mizuno loyalists usually tend to avoid soft running shoes, so we’ll skip our regular recommendations. Instead, we’d like to suggest the responsive yet supportive Triumph ISO 3 for those long runs. The Nike Zoom Streak 6 is a suitable speed-shoe alternative if the idea of buying a Hitogami 3 doesn’t appeal to your inner footwear geek. See what we did here? The ISO 3 and Streak 6 are rearfoot loaded creatures, just like the Rider 20 is. Even with the supposedly major updates, the Mizuno Wave Rider 20 feels a familiar shoe to step into. The heel, while softer, retains the snap of the Wave plate, and the snug midfoot is carried over from the WR-19. Where the WR-20 really sets itself apart from the previous versions is its updated material package. The mesh is brand new, and so is the detailing over the midfoot and heel. There’s a slight change in the forefoot fit quality, but other than that, the Mizuno Wave Rider 20 is not as different as one might expect. There’s no change in the weight or MSRP either. 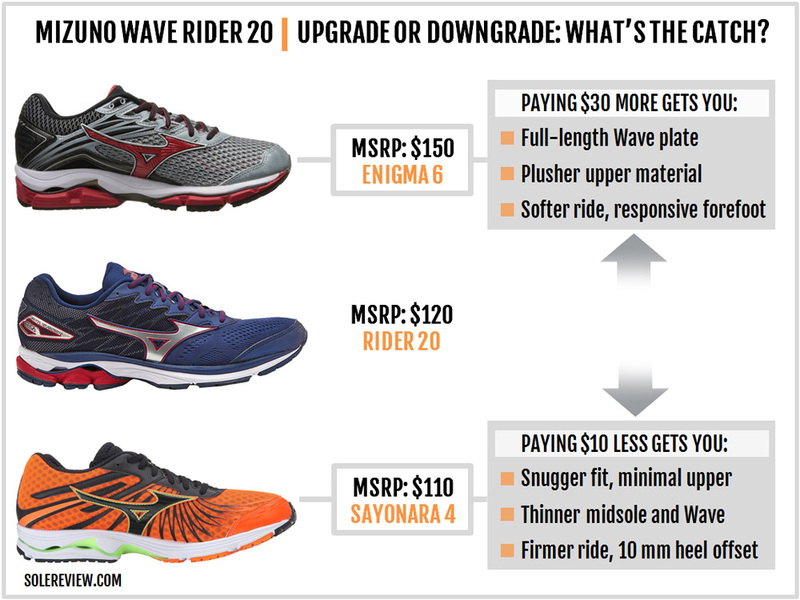 The $150 Wave Enigma 6 serves a lot more cushioning than the Rider 20, and is also equipped with a heel-to-toe Wave plate. This structural separation makes the Enigma 6’s ride softer and more responsive than the WR-20. For $30 more, you also get premium materials and aesthetic detailing. We don’t consider the Wave Creation 18 as a cushioning step-up. The all Wave, no foam heel makes the rearfoot hard, and the transition isn’t as seamless as other Mizunos which blend foam and Wave plate together. The Sayonara 4 is marketed as raceday-everyday training hybrid, but one can also see it as a watered-down Wave Rider 20. After all, it’s got a similar 10 mm heel offset (vs. the WR-20’s 12 mm), the upper has enough structure, and the midsole is padded enough.